Social Psychology 8 Edition Research made relevant through a storytelling approach. This renowned text maintains its acclaimed storytelling approach, teaching the science of psychology through an engaging narrative that makes research relevant to students. 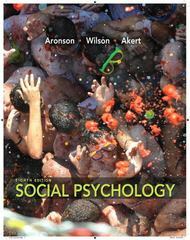 Drawing upon their extensive experience as researchers and teachers, Elliot Aronson, Tim Wilson, and Robin Akert present the classic research that has driven the field and introduce cutting-edge research that is the future of social psychology. Significantly updated to reflect advances in the discipline, the 8th edition provides a firm foundation for students to build their understanding of this rigorous science in a way that engages and fascinates. A better teaching and learning experience This program will provide a better teaching and learning experience— for you and your students. Here’s how: Personalize Learning — The new MyPsychLab delivers proven results in helping students succeed, provides engaging experiences that personalize learning, and comes from a trusted partner with educational expertise and a deep commitment to helping students and instructors achieve their goals. Improve Critical Thinking — The authors emphasize this rigorous science through research examples that encourage students to think twice about their preconceived notions of what social psychology is - and isn’t. Engage Students — Through real-life vignettes, which open each story chapter, and “mini-stories” throughout each chapter, the eighth edition provokes student interest by focusing on real-life examples. Explore Research — The authors present a balance between the latest findings in the field with classic research in social psychology. Noting that some older studies deserve their status as classics and are important cornerstones to the discipline, this text encourages students to experience the continuity and depth of the field versus regarding it as a collection of studies published in the past few years. Support Instructors — This program provides instructors with unbeatable resources, including state-of-the-art PowerPoints embedded with videos, the NEW MyPsychLab with ABC’s What Would You Do videos, an easy to use Instructor’s Manual, a robust test bank, and an online test generator (MyTest). All of these materials may be packaged with the text upon request. Note: MyPsychLab does not come automatically packaged with this text. To purchase MyPsychLab, please visit www.mypsychlab.com or you can purchase a ValuePack of the text + MyPsychLab (at no additional cost). ValuePack ISBN-10: 020591201X / ValuePack ISBN-13: 9780205912018.